Bark, snap, crackle – pop! That’s my overwhelming memory of a short spell behind the wheel of the latest Audi RS3. Finding a completely deserted, dead-straight country road, and flooring the throttle from a standing start, the RS3 propels itself forward with no hesitation, just a giant shove behind my shoulders. It might be small and non-threatening, but this is a seriously FAST car! The next thing that sticks in my auditory memory is the fantastic bark and pop as the dual-clutch transmission snaps between gears. It’s a lightning fast change and the tacho needle always seems to be resuming its climb northwards, towards the redline at 6700 revs. Actually the power comes in a fairly wide band between 5200 and 6700, thanks to the turbocharged torque, and if I could find a deserted track like the Nurburgring I could have a whale of a time using the flappy paddles for instant changes to keep the RS3 ‘on the boil’. Sadly, I’m in close proximity to the ‘burbs and the broader community, so there’ll be no playing a symphony at speed in this hot little hatchback. I’ll just have to imagine what it would be like at the ‘Ring, and settle for a few quick spurts here and there. Also dragging me back to reality is the price of this speedster, It has acceleration to match a Porsche 911 but it’s not cheap. For the car I’m driving, minus a sunroof, you’ll pay $78,900 and for my money, that’s just too much. Yes, it delivers big time, but really? It’s possible to get close to $100,000 if you tick all the boxes, and that’s a long way up the road from a similarly-punchy Volkswagen Golf R.
With its turbocharged, 278 kW, five-cylinder engine this little bugger actually gives you around 12 litres/100km in the city, and the combined fuel figure is 8.8. You might consider that pretty good for a fast car, but, remember it takes 98 RON – and that’s expensive stuff! I think an Audi S3 Sportback, with one less cylinder, and some ‘R Line’ add-on trinkets might make a more sensible choice. And there is also the Golf R.
You still get Quattro AWD in the S3, with a cool interior that’s big on subtlety and sophistication, plenty of useful performance, a marginally more comfortable ride – and you’ll pay up to $10K less. Bargain! The RS3, though, has some great interior design touches like the beautiful layout of the rear door trims integrating the speakers. Very stylish. The B&O sound system is pretty good too. On a practical note, while the test car boasted beautiful white leather/suede seats, and door trims, they are very easy to soil, and hard to clean. So it’s not particularly kid friendly. But I like the way that the infotainment screen hides itself away when you switch it off, dropping neatly into the top of the dash. When you’re motoring the screen provides a good sight-line and Audi’s approach to computerization, execution of the functions, and intuitive operation is still head-and-shoulders above many of its competitors. The RS3’s natural habitat may well be freeways, or rather autobahns, without speed limits. But find a curvy road, and maybe even some undulations to mix it up, and the RS3 will be fun, fun, fun. 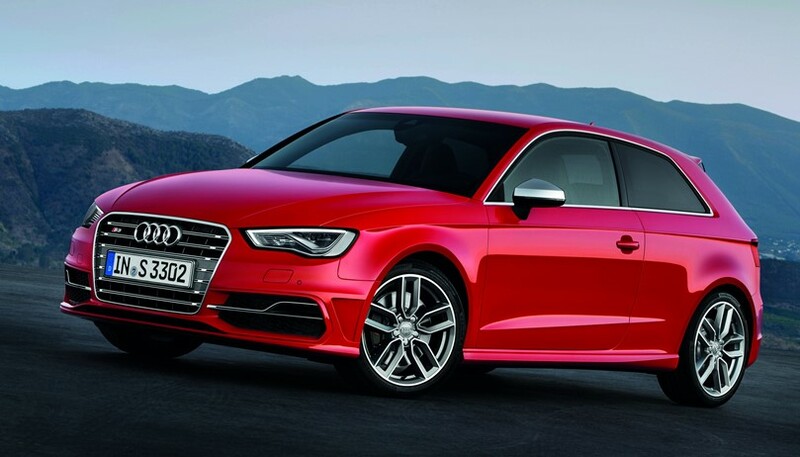 Exploiting Quattro AWD and the 'paddles' to the fullest, this is a car you can confidently keep upping the speed with which you enter corners, and exit tidily – without the need for interference from the electronic stability controls. I used the ‘Comfort’ setting, simply because I could get all the performance I needed, but my old bones appreciated the slightly softer ride. The ‘Sport’ setting is bad for dentures, fillings, and people who need regular chiropractic manipulations. But, hey, that’s what is great about being young, right? Flexible? I hate to say this, but the RS3 is almost the answer to a question nobody asked. It’s a completely legitimate high performance hot hatch, but like VW’s Golf R, there’s nowhere in our densely populated countries to really enjoy its potential, so why not an S3 with some go-faster kit? God, I’m getting old, sensible and boring. But, it was fun while it lasted! The Audi A6 allroad quattro was presented at the 2012 Geneva Motor Show, sales of this car began in 2012 with its first UK deliveries in July 2012. I got myself in a mass while trying to repair my car. But this repair manuals online free Audi helped a lot. KIA SORENTO SUV - Simply Unsurpassed Value! BABY LION WITH A BIG HEART! HAVE THE RAGING BULLS BEEN TAMED?